The LIFE team are currently undertaking an extensive survey of Killyconny Bog SAC and we will present the results here soon. The bog has been modified in the past through drainage and cutting which has resulted in the drying out of the surface and a consequent loss of species. The total area of uncut high bog is 83.04ha while the remaining 108.18ha is mostly cutover bog resulting from previous turf- cutting, which has completely ceased on this bog. Despite the loss of species, both areas are still teeming with life and restoration will add a more sustainable, natural habitat. The information below is gleamed from previous site survey work, and paints an interesting picture of a unique living bog. Killyconny Bog supports the full complement of plant species typically associated with a midland ridge basin raised bog. Much of Killyconny Bog is very wet and there are many areas of pool and hummock formation. The pools support the bog moss Sphagnum cuspidatum, and a good growth of algae in summer. Wet areas about the pools support other Sphagnum mosses such as S. magellanicum, while S. papillosum, S. fuscum, S. capillifolium and Hypnum cupressiforme are important components of hummocks. A range of vascular plants typical of raised bogs are found, including cottongrasses (Eriophorum angustifolium and E. vaginatum), heathers (Calluna vulgaris and Erica tetralix), Bog Asphodel (Narthecium ossifragum) and White Beak-sedge (Rhynchospora alba). 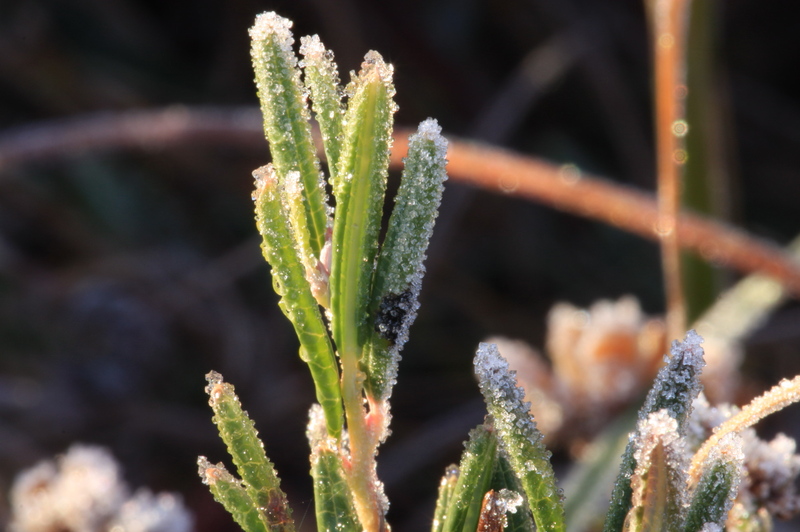 Also occurring on the site is Bog-rosemary (Andromeda polifolia) which is found almost exclusively on midlands raised bogs and which is rare in north-east Ireland. 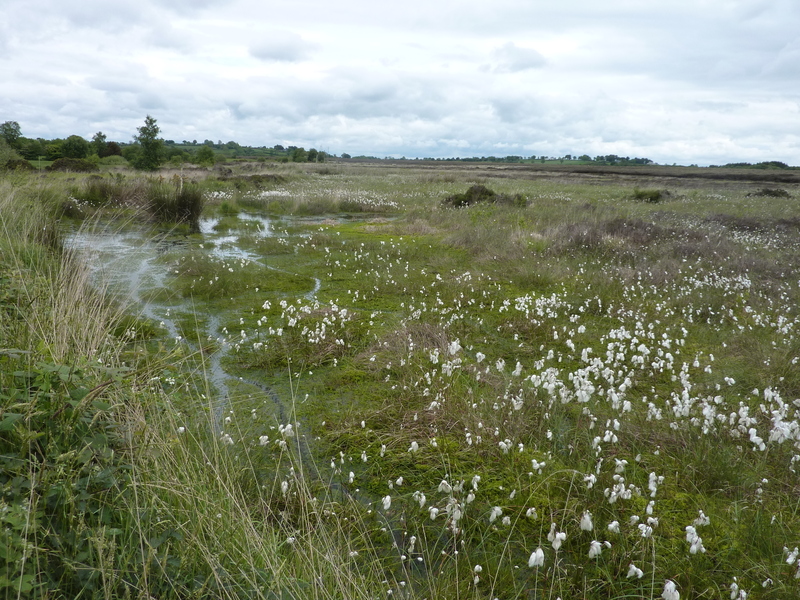 While the surface of the bog is generally homogeneous some higher areas with dense tussocks of Hare’s-tail Cottongrass (Eriophorum vaginatum) are found; these provide shelter for Hares. There are also lines of water movement, shown by the occurrence of Common Sedge (Carex nigra) and Soft Rush (Juncus effusus). The most recent survey from 2014 indicates that central ecotope is found on Killyconny Bog at only one location and sub-central ecotope at six locations (Fernandez et al. 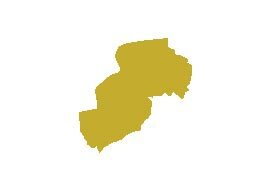 2014a, b). The central ecotope occurs in a depressed area featuring hummocks, hollows, and pools (34-50%). Sphagnum cover ranges from 51-75%, and consists of Sphagnum capillifolium, S. austinii, and S. fuscum, S. magellanicum and S. papillosum hummocks and S. cuspidatum in pools along with Drosera anglica. The cover of Sphagnum cuspidatum is patchy in some pools that appear to be suffering from desiccation in places. Sub-central ecotope areas consist of low Sphagnum capillifolium hummocks and hollows with S. cuspidatum in places. Overall Sphagnum cover is greater than 50%, and reaches 75% in places. Other Sphagnum species include S. papillosum, S. fuscum, S. magellanicum, S. tenellum, and S. subnitens. Sub-central ecotope becomes wetter in other sections where pools dominated by S. cuspidatum are found, but are rather small and contain high Narthecium ossifragum and Rhynchospora alba cover. Non-active ecotopes present on the bog include sub-marginal, marginal, and face bank ecotope. Although some of the sub-marginal areas have a relatively well-developed raised bog flora, they are affected by water loss to varying degrees, and are usually devoid of permanent pools. The sub-marginal ecotope features the most developed microtopography, with higher presence of hummocks and hollows (frequently dominated by Narthecium ossifragum and only occasionally Sphagnum cuspidatum and S. tenellum). Sphagnum covers up to 33% of the ground and mostly consists of S. capillifolium. However, Sphagnum papillosum, S. magellanicum, S. tenellum and S. subnitens are also found forming hummocks and S. cuspidatum in hollows. The most widespread sub-marginal ecotope vegetation type on the site is characterised by dominant Calluna vulgaris, Erica tetralix and Narthecium ossifragum. Eriophorum vaginatum, E. angustifolium, Rhynchospora alba, and Trichophorum germanicum are also common at various degrees of coverage. Marginal ecotope is slightly drier than sub-marginal ecotope and mainly occurs as a narrow band near the margins of the high bog. Microtopography consists of Heather Calluna vulgaris hummocks, low Sphagnum hummocks, flats and very occasionally hollows. The Sphagnum cover is even lower here than in the sub-marginal ecotope (<10%) and the vegetation is characterised by higher cover of Narthecium ossifragum, Trichophorum germanicum, and Calluna vulgaris. Face bank ecotope is characterised by firm ground, tall Calluna vulgaris, poor Sphagnum cover and a flat microtopography. This ecotope is found at the edges of the high bog. Peat cutting is no longer carried out at the site. Rhynchosporion vegetation is widespread on Killyconny Bog. It is found in both ARB and DRB, but tends to be best developed and most stable in the wettest areas of ARB. In these areas, the Rhynchosporion vegetation occurs along pool edges and on lawns underlain by deep, wet and quaking peat. Typical plant species include Rhynchospora alba, Sphagnum cuspidatum, S. magellanicum, S. papillosum, Drosera anglica, and Eriophorum angustifolium. Rhynchospora alba was also found in more degraded situations, but always associated with wet features such as hollows. The north and west cutover includes areas that are dominated by embryonic bog vegetation with low hummocks of Sphagnum palustre and extensive depressions dominated by Sphagnum cuspidatum and Eriophorum angustifolium. The degraded bog is largely restricted to the margins of the high bog areas where drainage effects are most pronounced. In general, much of the degraded bog surface is dominated by Heather (Calluna vulgaris) and Deergrass (Scirpus cespitosus) with Bog Asphodel and White Beak-sedge dominating in the wetter areas. Typically these species form mono-dominant, species-poor stands. In the driest areas of degraded raised bog there is some colonisation by plant species such as Downy Birch (Betula pubescens) and Bracken (Pteridium aquilinum). The uncut high bog area is surrounded by extensive cutover surfaces and a portion of this cutover has been planted with conifers. A previous LIFE project removed a large amount of conifers which saw an immediate increase in the amount of ARB. Irish hare (Lepus timidus hibernicus) and pygmy shrew (Sorex minutus) have been recorded on the high bog. 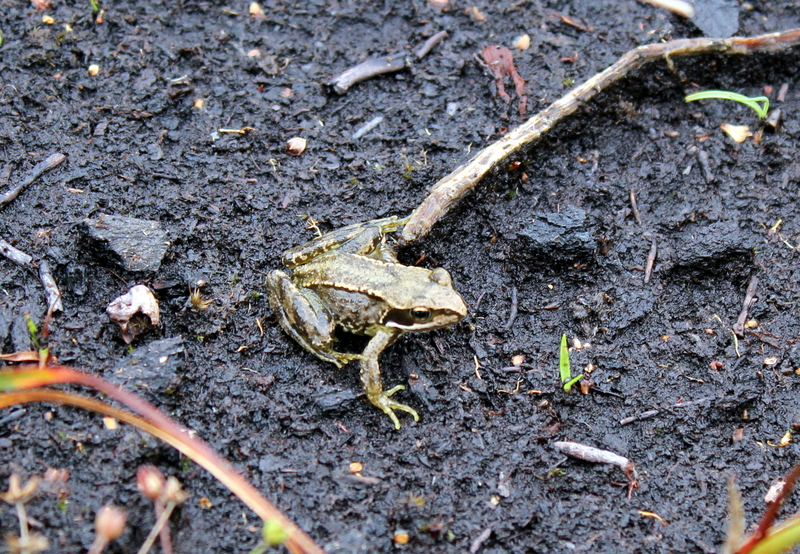 The common frog (Rana temporaria) also occurs. Bird species found on the bog include curlew (Numenius arquata), snipe (Gallinago gallinago), skylark (Alauda arvensis), meadow pipit (Anthus pratensis), and sometime kestrel (Falco tinnunculus). Foxes and badgers have discovered in larger hummocks, and insect-wise the bog – like all raised bogs – is alive and well with bog caterpillars, moths and various butterflies seen, as are dragonflies, damselflies and various water skaters, water beetles, water boatment, slugs and spiders. As detailed in our Local, Community and History pages, local man John K Smyth was written about the bog teeming with life in the 1950’s and 1960’s, with the Curlew in particular being very prolific. Pheasants, Red Grouse, Red Partridge, Snipe, Pied Wagtail, Moorhens, Cuckoo, Reed Warblers, Woodcock, Kingfisher and Barn Owls were all common and are detailed in John’s bog memory piece. The LIFE team will have an up-to-date fauna report here soon.